Iron Horse is a certified franchisee installer of LMK Cured in Place Pipe (CIPP). We have successfully installed LMK products such as T Liners, Vac-A-Tee's, and Sectionals in the Portland Metro Area as well as Washington, Montana, and Idaho. 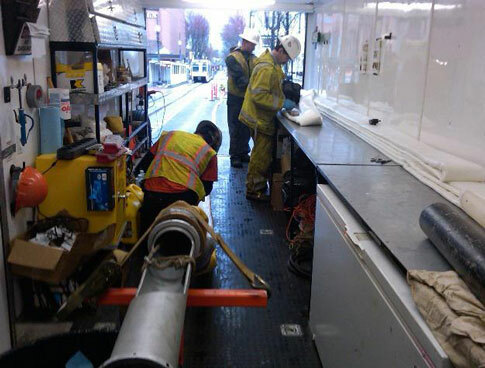 Our highly-trained technicians are certified and participate in continuous education to ensure that we are on the cutting edge in the trenchless technology field. Used for lightweight structural backfill and existing utility abandonment fill, light weight cellular grout is injectable, and the Iron Horse LLC is able to produce cellular grout for a wide variety of strengths and densities. Watch how our T liners are installed! "VAC-A-TEE is a trenchless cleanout installation system that is environmentally friendly, utility friendly, and installer friendly. 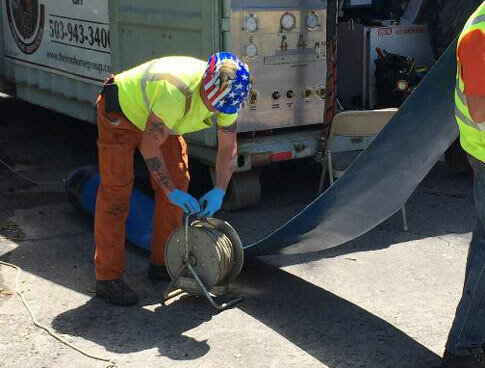 Installed by means of hydro or vacuum excavation, the VAC-A-TEE system is a clean and safe method for installing a new cleanout, which provides access to the sewer lateral pipe for cleaning, lining, root removal, CCTV, etc. The system involves a patented PVC saddle, riser pipe of appropriate length, and proprietary hybrid adhesive/sealant. After a small diameter borehole has been created, the contractor applies the adhesive to the underside of the saddle and then snaps it onto the lateral pipe. Once the adhesive cures, it forms a watertight seal with the pipe, and a diamond core saw is then used to cut and remove the crown of the pipe. Finally, the borehole is backfilled, and sod is used to restore the landscaping, leaving the yard virtually untouched". "LMK's Performance Liner® Sectional process renews pipes from 6 to 36 inches in diameter and in continuous lengths up to 50 feet. The liner can be inverted anywhere in the pipe with no trimming or cutting. The result is a structural, root proof, watertight seal. Performance Liner Sectional conforms 100% to ASTM F2599-11. Gasket-sealing technology is used at the terminating points of the liner by embedding LMK patented Insignia™ Hydrophilic O-Rings between the liner and host pipe to ensure a watertight seal. Compressible material is incorporated at the upstream and downstream ends of the liner for a smooth tapered transition to the old host pipe. During the positioning process, there is no resin loss because the liner is fully contained in the launch hose. Resin comes in contact with the pipe only at the point of repair and migrates into fractures and open joints creating a mechanical lock. 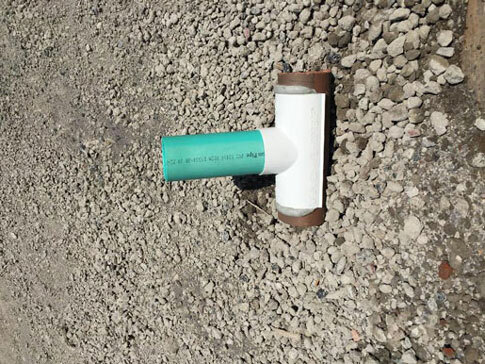 Unlike other less precise systems, air pressure is never dropped, which would allow jarred sections of pipe to collapse onto the liner causing further damage and a potential dig. Other 2-step inversion systems also have an uneven resin distribution from the crown to the invert of the pipe. Performance Liner Sectional Repairs are a one-step, long-term, CIPP solution."